December 1, 2012: Awesome Allie: First Kid Astronaut begins its run at Titusville Playhouse in Titusville, FL. September 12, 2012: Vote For Me: A Musical Debate begins its run at St. Agnes Academy in Houston, TX. July 31, 2012: Ivy+Bean begins its week-long workshop with Bay Area Children’s Theatre in Berkely, CA. February 10, 2012: Magic School Bus, Live! The Climate Challenge celebrates its 100th performance on tour! January 26, 2012: Magic School Bus, Live! The Climate Challenge is now playing at the Oregon Children’s Theatre, in additon to its ongoing national tour! Click here to read the review! November 10, 2010: Critics love LONG STORY SHORT. Read the reviews here. November 9, 2010: COLIN QUINN LONG STORY SHORT opens at the Helen Hayes on Broadway! Watch the opening night video here. October 22, 2010: COLIN QUINN LONG STORY SHORT, directed by Jerry Seinfeld and featuring Original Compositions by Scott, begins previews at the Helen Hayes on Broadway tonight! October 17, 2010: VOTE FOR ME ends its successful run at the 2010 New York Musical Theatre Festival with another Democratic win. Now go out and vote for real on November 2nd! October 11, 2010: VOTE FOR ME opens to a sold out house, and the Democratic candidate wins by just two votes. Performances continue all week long at Urban Stages–come and get out the vote! October 5, 2010: VOTE FOR ME: A Musical Debate opens one week from today! Tickets are very limited–reserve yours here! September 30, 2010: NYMF Student Leadership interviews Scott and Drew about VOTE FOR ME: A Musical Debate. 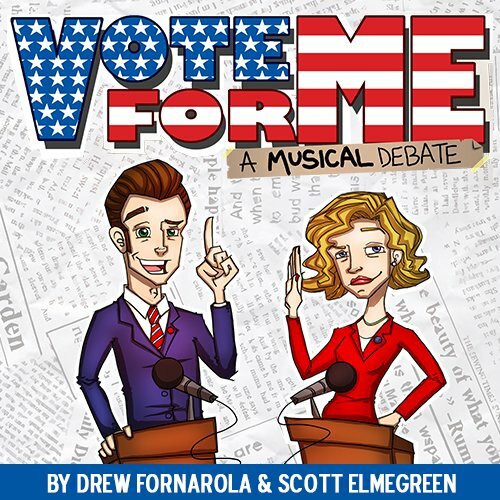 September 21, 2010: Become a VOTE FOR ME: A Musical Debate fan on Facebook here! September 17, 2010: VOTE FOR ME: A Musical Debate casting is announced! Starring Catherine Cox (Footloose; Oh Coward! – Tony Award Nom; Baby – Drama Desk Award; Shakespeare’s Cabaret; One Night Stand; Barnum; Oklahoma! ; Whoopee! ; Music Is) and Ralph Byers (The Music Man; Big River; Goodbye Fidel; Herzl) as the presidential candidates, and featuring Keith Buterbaugh (Company; The Phantom of the Opera); Kristy Cates (Wicked), Cheryl Freeman (The Civil War – Drama Desk Award Nom; Play On; The Who’s Tommy); and Jay Russell (Our Town – Barrow Street; The Play What I Wrote). (Playbill, Broadwayworld, Talkin’ Broadway). Visit www.debatemusical.com for more information, and click here for tickets! August 20, 2010: Scott has new underscoring featured in The Arden Project, “a transatlantic utopia”, culminating in a simultaneous London and New York performance, and broadcast live here from 11am-12pm EST. August 6, 2010: Click here to listen to the COLIN QUINN LONG STORY SHORT podcasts, featuring original music by Scott. July 28, 2010: Colin Quinn Long Story Short extends Off-Broadway! Now playing through Sept. 4 (Playbill). Click here for tickets. July 24, 2010: Prospect Theater Company is presenting “WHO KNEW? : A New Musical Revue,” featuring scenes by Scott, at The Kirk Theatre @ Theatre Row (410 West 42nd Street). Other contributing writers, composers, and lyricists include Dan Acquisto & Sammy Buck, Michael Colby & Ned Ginsburg, Jeremy Desmon & Vadim Feichtner, Drew Fornarola & Callie LeFevre, John Herin & Alden Terry, Timothy Huang, Kait Kerrigan & Brian Lowdermilk, Peter Mills, James Morgan & Sheilah Rae, Benj Pasek & Justin Paul, and more! Performances at Sat 7/24 @ 3pm, Mon 7/26 @ 8pm, Tues 7/27 @ 7:30pm, Thurs 7/29 @ 4pm, and Sat 7/31 @ 3pm. Click here for more information and here for tickets! (Broadwayworld, Playbill, Vanity). Click here for tickets. May 24, 2010: COLLEGE The Musical will play this August 12-15 at the State Theatre of Bay City, MI. Click here for tickets and information. November 30, 2009: NY Theatre Barn’s “Good Enough for Now,” directed by Scott, plays to a sold out house.